The environmental impact of oil spills is immense, and scientists are always looking for better ways to minimize this. Currently, for oil spills in open waters, one of the most commonly used methods is to carry out what is known as ‘in-situ burning’. This involves burning off the oil from the surface of the ocean before it has a chance to sink or move with the ocean currents and cause a huge amount of ecological damage over a large area. Whilst this technique has its advantages, it also has many limitations including that these fires can harm marine life through tar deposits, create a significant amount of smoke and are difficult to keep alight. Despite these limitations, in-situ burning does remain a popular method. During the clean-up of the Deepwater Horizon disaster in 2010, more than 400 in-situ burns were completed. 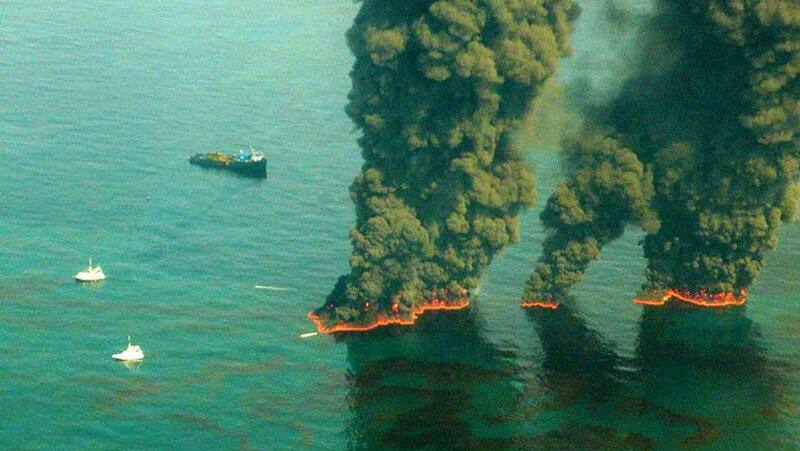 It’s estimated that these burns removed up to 310,000 barrels of oil from the surface of the ocean. Improving this technique of in-situ burning is an important advance in improving our response to oil spills, and a team of scientists from the Worcester Polytechnic Institute in Massachusetts have been working in collaboration with the Bureau of Safety and Environmental Enforcement (BSEE) to achieve just that. Their intention was to achieve a more complete combustion, therefore leaving less environmental pollutants behind. The result, known as The Flame Refluxer, accelerates the burning of an oil spill, with the outcome being lower levels of pollutants released into the air. The Flame Refluxer is made up of a combination of metal coils, and a blanket made of both copper wool and copper mesh. The idea is that the coils and copper act to heat up the oil by transferring heat from the flames, thus improving the efficiency of the combustion. This results in fewer pollutants being released and less deposits of tar remaining afterwards. Additionally, any tar residues should be collected by the copper wool so do not enter the water column. The Flame Refluxer was specifically designed to be inexpensive and easy to operate. This means that multiple units can be deployed, even in harsh and remote areas of our oceans. Whilst the team are still analysing the data they collected during the test burns, initial observations certainly seem to suggest that the Flame Refluxer performed as well or if not better than they had hoped. It appears that up to five times as much oil was burned per minute, with very little tar residue remaining. The Federal Bureau of Safety and Environmental Enforcement have invested $1.5 million to help develop this technology, in an effort to improve responses to oil spills. The next stage is to test the Flame Refluxer in open water as opposed to an enclosed test facility. It does look as though promising technology such as this is bringing us one step closer to improving our responses to these devastating man-made disasters.